Project Appraisal PPTX Template - ANALYSISTABS - Innovating Awesome Tools for Data Analysis! Here is a Free Project Appraisal PPTX Template. You can download the template using the below link. This Project Appraisal PowerPoint Template works in Microsoft PowerPoint 2007,2010,2013,2016 and above. This Project Appraisal PPT Template is a PowerPoint Format Project Appraisal Report Template. You can enter the project information which you have assessed. You can use the left-hand side section for your observations. And right-hand side table will help you to capture the assessed metrics. The bottom section of the PPT template helps you to write your conclusion or Summary. 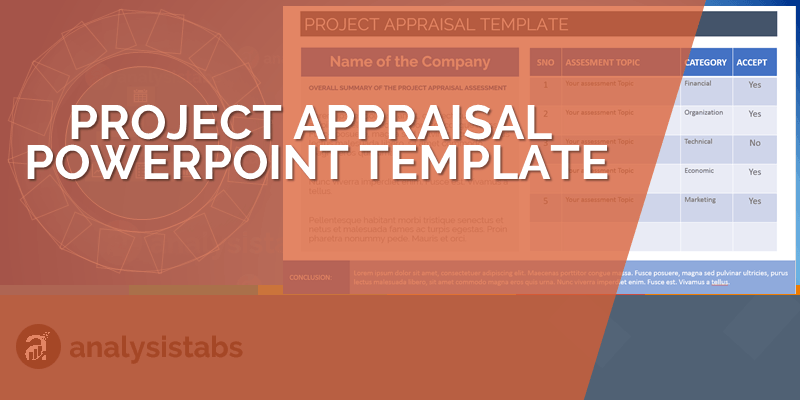 You can use this Project appraisal PPT template in Team and Customer Presentations.